MELANIE OUDIN TO JOIN FIELD AT GOLDWATER CLASSIC!!! Phoenix Country Club Director of Tennis Sara Stablein proudly announces the return of the Goldwater Women’s Tennis Classic. The event is bigger and better this year as a $75K USTA Women's Pro Circuit event, hosted by the Phoenix Country Club and will be held November 7-14, 2010. The event will once again benefit the Boys & Girls Clubs of the East Valley in order to grow and sustain their after school tennis programs. The Grant Woods Law Firm is the event's presenting sponsor. 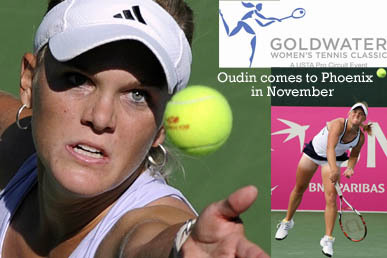 Oudin, the teenage darling who wowed the 2009 US Open with her run to the quartefinals, has committed to play in the 2nd Annual Goldwater Women's Tennis Classic in November, tournament officials announced. The 19-year-old American made her breakout splash in the Phoenix area, helping lead the United States team to a 3-2 victory in early 2009 in a Federation Cup first-round tie against Argentina. Oudin is currently ranked No. 69 in the world, down from a career high in April at No. 31. Oudin will likely be among the top seeds when the draw is announced. Other notables committed to play are Renata Voracova (No. 75), Edina Gallovits (No. 76), defending champion Varvara Lepchenko (No. 88), Sabine Lisicki (No. 101), United States Fed Cup team members Jill Craybas (No. 104) and Coco Vandeweghe (No. 114). To see the complete entry list, click HERE. Opening Ceremonies & Community Outreach Day will kick off the week-long event on November 7 including kid’s clinics, sponsor clinics and qualifying rounds. A Pro/Am and Celebrity Pro/Am event will be held on Monday, November 8. A Player Party will be held Tuesday, November 9 and Military Troops & Vets Day will be held Thursday, November 11 including a featured evening match. November 12 is Ladies' Day featuring a Ladies Luncheon and Fashion Show between matches. This year will feature evening matches Wednesday, Thursday and Friday night. Closing Ceremonies and Final Match will be held on Sunday, November 14. All players are taking their last chance to compete for WTA Tour points in order to qualify for the 2011 Australian Open. Defending champion is world No. Sponsorships for the Goldwater Classic are still being accepted. To find out more information on how your company can get involved click HERE, or please contact Sara Stablein at 602-636-9840 or email to goldwaterclassic@phoenixcc.org.